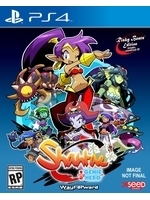 Shantae is back in Shantae Half-Genie Hero and it is clearly a game which deserves your attention if you like good old platformers. Contrary to the previous episodes whose art style was faithful to the 16-Bit era, this new adventure has decided to drop the pixelated visuals, but to keep them just as colorful as before thankfully. It is now available on PS4, Playstation Vita, PC, Xbox One and Wii U we've been having a lot of fun playing so far. 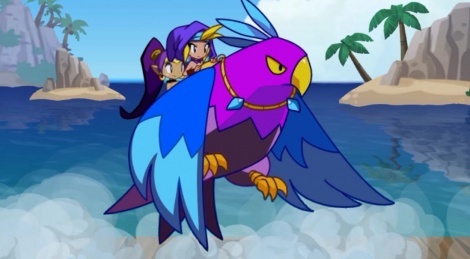 Thanks to Shantae's many unlockable transformations, not only can you progress into the story, but you can also do some backtracking to access previously unreachable areas, which all contain various bonuses (new powers, hearts, gallery keys etc.). If you're looking for a new game to play this end of year, look no further, Half-Genie Hero is just what you need. I've been playing this but not very far into it yet. Just the first boss. I prefer this over the previous games partly because I'm just not into modern pixel art. It just isn't the same as it was 20+ years ago. I love the visuals in this game and the animation, colors and art style are just great. I love the mix of 2D and 3D, although I think that some of the elements that look 2D are actually 3D models. That's what is great about it. It makes you wonder and look closely, then you appreciate the artists and their work. The gameplay is pretty classic. Easy to control and tight. Definitely worth the asking price. I have all 3 games, but haven't had the chance to play any of them yet. But their gameplay looks solid. As for modern pixel art style, I agree 100%. Very few developers are able to achieve a nice quality with it, they believe it's just make whatever and turn it into pixel art and that's it. If the developers don't actually plan and put a lot of care into how each character, background, object, enemy, etc needs to have a consistency with game's overall look, it will look "off" and ends up looking like a visual mess. Games that do have a very good pixel art quality like 8-16 bit games are: Shovel Knight, Chasm, Deer God, Papers Please, Rogue Legacy, Super Meat Boy, Fez, Terraria, Mercenary Kings, and Hotline Miami, to name a few. Yes, my bad. I was actually going through my memory, should have looked on Steam or Wikipedia, since I don't remember all of them. But the really nice thing about these games is that if you compare them to 8-16 bit games like Mega Man, Castlevania, Metroid, etc, they still look good because there is a consistency in the art style, which is essential, imho, for a pixel art game. PS. When will Gamersyde cover Stephen's Sausage Roll? XD It has a MetaCritic score of 90 and has received a "Essential" badge from EuroGamer - it was a kind of internal joke, but the game is really great. Lovely visual execution (unlike the last) and great music. Feels like when I was playing Sonic for the first time.